Yamamoto Nizo (山本二三) was born in 1953 and is a rather prominent art director and artist. Some of the films he has art directed includes Future Boy Conan (1978), LAPUTA: Castle in the Sky (1986), Grave of the Fireflies (1988), Princess Mononoke (1997), The Girl Who Leapt Through Time (2006) and more. He has also drawn background art for films such as Spirited Away (2001), Welcome to THE SPACE SHOW (2010), etc. The art for these aren't included in the book though. Much of the background paintings are of Japanese countryside, towns, landscapes and greenery. It's all beautiful. The landscape and forest paintings do remind me of Kazuo Oga. There's more coverage on The Girl Who Leapt Through Time. Many paintings are for films I've not heard of before. There are some techniques sections in the book about painting clouds, water, earth and fire. And all paintings have commentary. 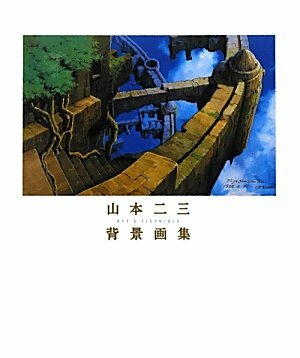 Nice book if you like Japanese animation background art. WOOOW, why do these books never come out in Europe ?? ?